The Pluto team is intrigued that such a small planet can have such a complex collection of satellites. The new discovery provides additional clues for unraveling how the Pluto system formed and evolved. The favoured theory is that all the moons are relics of a collision between Pluto and another large Kuiper belt object billions of years ago. That Pluto is getting to be a tough little dwarf planet! Kind of like a mini Jupiter! I"m curious to know if Pluto is thought to have a ring system? After the discovery of Nyx and Hydra, the possibility of a Pluto ring system was proposed, and again after P4 was discovered. This discovery of P5 will probably fuel further speculation, especially if all of Pluto's moons are coplanar, which they appear to be. Charon and the other four moons are possibly the result of a collision between Pluto and another KBO, and a debris ring is possible. We probably won't know for certain until the eminent arrival of New Horizons. Alternative plans for safe passage have already been made if a ring system is discovered. The discoverers of Pluto's two tiniest moons are inviting the public to help select names for the new moons. By tradition, the moons of Pluto have names associated with Hades and the underworld. Beginning today, people can vote by visiting: Pluto Rocks! "The Greeks were great storytellers and they have given us a colorful cast of characters to work with," said Mark Showalter, Senior Research Scientist at the Carl Sagan Center of the SETI Institute in Mountain View, California. He and the teams of astronomers who made the discoveries will select two names based on the outcome of the voting. Until now, these small moons have been referred to as, simply, "P4" and "P5". Like Pluto's three other moons, Charon, Nix and Hydra, they need to be assigned names derived from Greek or Roman mythology. Visitors to the web site will also be able to submit write-in suggestions. These will be reviewed by the team and could be added to the ballot. Voting will end Feb. 25, 2013. The final names will be announced after their formal approval by the International Astronomical Union. 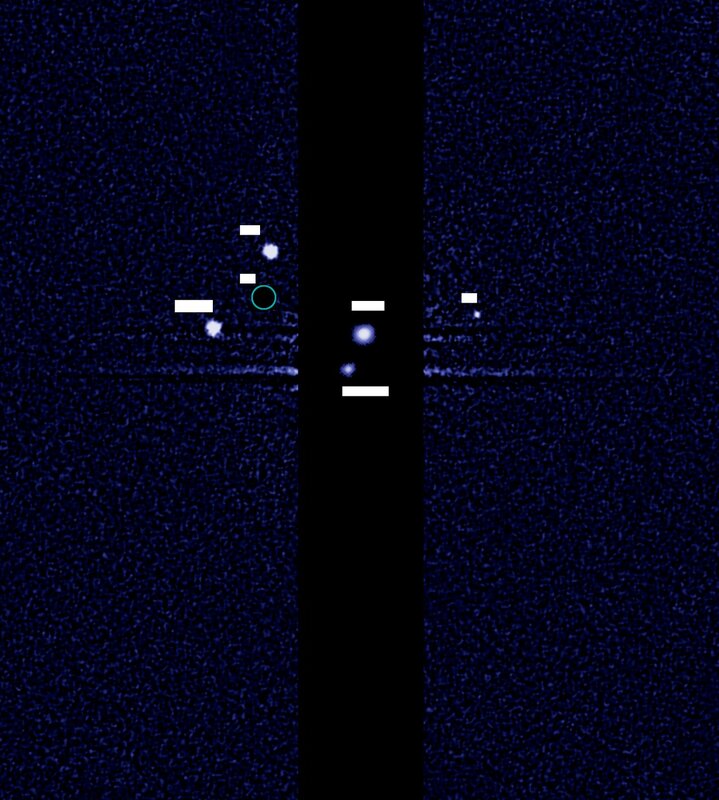 P4 was discovered in 2011 in images taken by the Hubble Space Telescope. P5 was discovered a year later during a more intensive search for previously unseen objects orbiting the distant, dwarf planet. The moons are only 20 to 30 km (15 to 20 miles) across. Currently, Pluto is receiving special scrutiny by astronomers, because NASA's New Horizons spacecraft is slated to arrive there in July 2015. I was wondering what that yelping off in the distance was. By tradition, the moons of Pluto have names associated with Hades and the underworld. Beginning today, people can vote by visiting: Pluto Rocks! "The Greeks were great storytellers and they have given us a colorful cast of characters to work with," said Mark Showalter, Senior Research Scientist at the Carl Sagan Center of the SETI Institute in Mountain View, California. He and the teams of astronomers who made the discoveries will select two names based on the outcome of the voting. 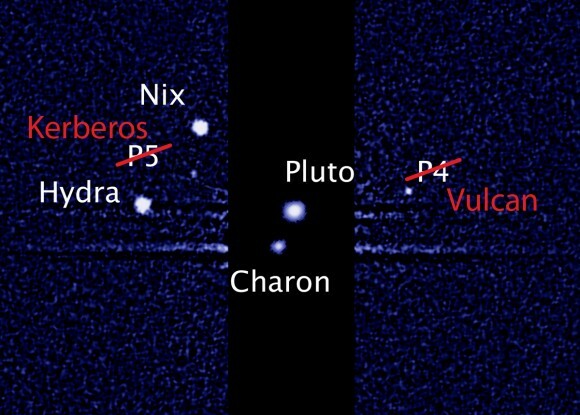 Until now, these small moons have been referred to as, simply, "P4" and "P5". Like Pluto's three other moons, Charon, Nix and Hydra, they need to be assigned names derived from Greek or Roman mythology. Visitors to the web site will also be able to submit write-in suggestions. These will be reviewed by the team and could be added to the ballot. Voting will end Feb. 25, 2013. The final names will be announced after their formal approval by the International Astronomical Union. Never mind, forgot they should be Greek names. And underworldly. The next step will be to submit these names to the International Astronomical Union for official approval, a process that could take 1–2 months. Course he's got a name, he's mine (sorta). Cerberus, is currently used for an asteroid. So because the IAU typically tries to avoid confusion with two objects sharing the same exact name, Showalter said he will use the Greek version of the spelling: Kerberos. Hagrid: Course he's got a name, he's mine.